Aberdeen-based NRG Group announced two new directors have been appointed to lead the family-owned company. The company, which consists of NRG Well Examination and NRG Well Management, was founded by Andrew Mackay in 1988. 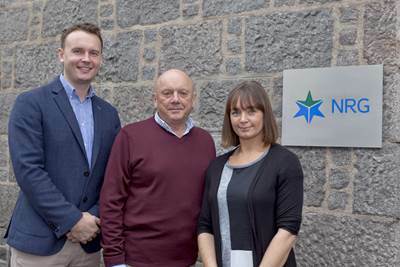 Mackay has handed the reins to his son, Daniel Mackay, and daughter, Erica McPherson, who have taken up the newly-created roles of managing director at NRG Well Management and NRG Group Commercial Director respectively to shape the future direction of the company. Andrew Mackay remains involved with the business as chairman and majority shareholder. Daniel recently returned to the U.K. from Australia, having worked as a senior drilling engineer for various oil and gas operators where he gauged a better understanding on the climate for the NRG business in future. He previously held roles with NRG Group as Drilling Engineer and Night Drilling Supervisor. Erica has been with NRG Group for more than 10 years starting as Contracts Administrator working up through various roles across all departments. Andrew Mackay said, “I have made the decision to pass the operational and financial reporting responsibilities of the business over to my children after over 30 years of running what is now the NRG Group. They have demonstrated the commitment to do it, and I have deep belief in their knowledge, ideas, and ambitions to drive the company forward. Erica McPherson added, “NRG is more than just a company to us, it’s a responsibility. Personally, I want to build on the existing business my father developed and I’m ready to face the challenges head on. I’m excited for the future of NRG Group in Aberdeen and around the world.